Ahhhhh. The rain has returned after a three month hiatus and my allergies have finally calmed down. Now it is the perfect weather to be baking often again. 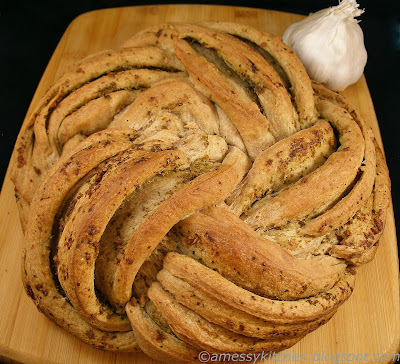 The BBB suggested a braided bread for World Bread Baking Day and invited buddies to join in. This time I decided not to do my standard sweet interpretation. Yes, we went garlicky with this beauty. I think it's appropriate since garlic is sometimes known as the stinking rose. ☺ Although since it is so pretty, I can definitely see myself making an almond/honey or cinnamon version for Thanksgiving breakfast. I noted my changes to the recipe in red. I did have an oh crud! moment as I was getting the dough mixed up, got all the butter incorporated and realized I had not added the yeast! Ahh! Run, grab yeast, dash it in, make sure it gets worked through well. Whew! Good thing I use instant yeast. I also decided not to do all spelt this time since I really wanted the braid to work well. I have some kamut now that I will experiment with in bread to cover the shortcomings of using all spelt. They are both ancient grains but have complementary properties with regard to dough structure and elasticity. For my filling I chose a bare spread of butter topped with a few tablespoons of pesto to which I had added half a head of fresh pressed garlic. It smells SO awesome folks. Sweet or savory, this is worth a try and really quite easy given how spectacular it looks. 1. Set oven to 210c (410F) Prep: Baking Pan - 26cm (10") springform (no bottom), take a piece of parchment paper and crimp tightly around the bottom of the springform, oil the sides. Place on top of a baking sheet. Set aside. 9. 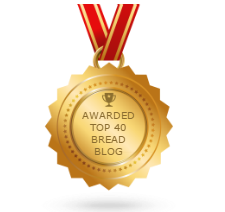 You are welcome to bake this with all white flour or any combination of flour you like. Awesome, really looks like a rose but I doubt I can handle this! Aw, thanks! It's really much easier than it looks. 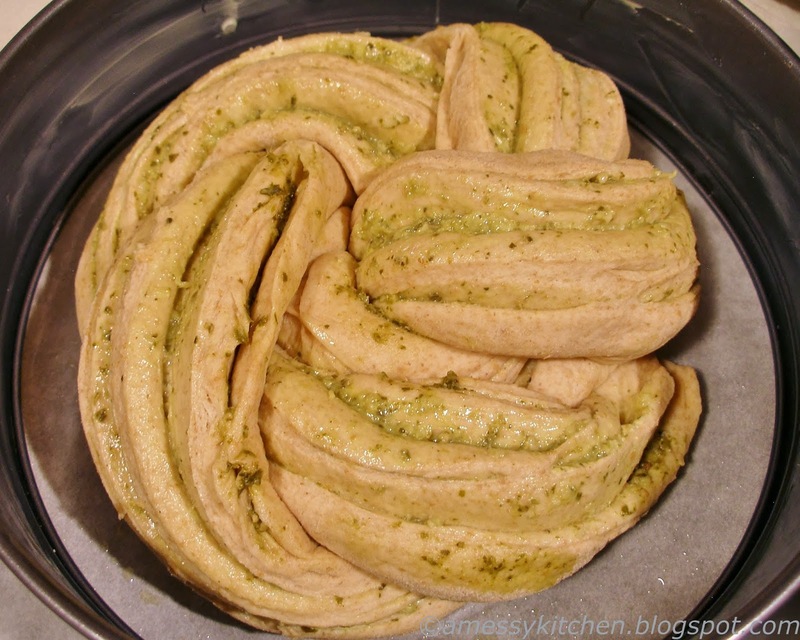 Just roll up the dough long ways (you want a long thin roll) cinnamon roll style, then cut the roll in half lengthwise. Turn the cut side up and do a simple two strand twist/braid, then coil it up. You're supposed to put it inside a 10" springform w/out the bottom to keep it in check but I know some people baked it in just a parchment lined pie pan. I love the deep well defined crevices that you achieved. 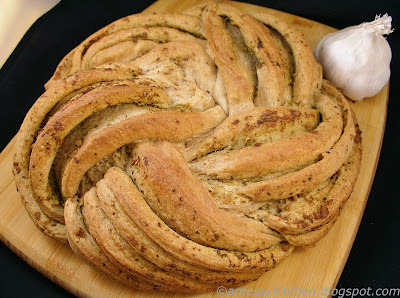 Beautiful bread! Thanks! I think it ended up like that because I DIDN'T have room to roll it out very thin and have so many layers. So the four or so layers there were opened up more.